A series of one-hour webinars designed to introduce dentists, public health professionals, and career advisors on the emerging profession of dental therapy in Vermont. In 2016, Vermont became the third state government in the U.S. to authorize the licensing of dental therapists. Vermont’s law establishes a prerequisite that dental therapists be Vermont licensed dental hygienists. Dental therapists play a key role in increasing access to dental care and preventing emergency room visits for dental–related problems. Dental Therapists (DTs) are mid–level practitioners licensed by the Board of Dental Examiners who serve as members of an oral health care team. They conduct oral evaluation and assessment, provide preventive and restorative dental care (including the non-surgical extraction of certain diseased teeth), treatment plan formulation, and more. The full scope of practice can be found in statute at 26 V.S.A. § 613. DTs practice under the supervision of a licensed dentist, with the limits of their practice defined in a Collaborative Management Agreement (CMA). CMAs are detailed contracts that outline a DT’s scope of practice (up to the full scope authorized in statute), type of supervision (general or direct), referral protocols, and other conditions governing the DT’s practice. The full requirements for CMAs can be found in statute at 26 V.S.A. § 614. Vermont state statute Title 26, Chapter 12, Subchapter 3a (26 V.S.A. § 611-617) defines specific educational, examination and practice requirements for licensed dental therapists. Vermont is the first state to require that dental therapists graduate from an education program accredited by the Commission on Dental Accreditation (CODA), the nationally-recognized accreditation body for dental education programs. CODA standards were adopted and implemented in 2016. The accreditation process is estimated to take 12-18 months, so there are no accredited programs yet in the United States. Vermont Technical College is developing a dental therapy program at their Williston campus. The anticipated start date for the program is 2019, with the first class graduating in 2020. 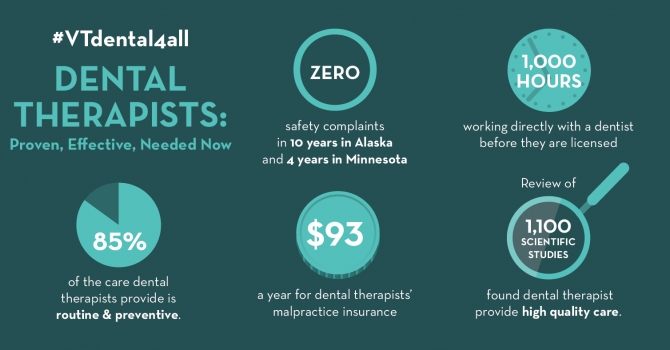 There are two programs training dental therapists in Minnesota. Although they are not yet CODA accredited, their standards may be considered substantially equivalent by Vermont’s Board of Dental Examiners, allowing DTs trained at these institutions to apply for licensure by endorsement. Dental therapists from other jurisdictions interested in applying for licensure in Vermont should contact the Vermont Board of Dental Examiners. The law defines specific services that a dental therapist can perform. The full scope of practice can be found in statute at 26 V.S.A. § 613. Dental Therapists work under the direction of a Vermont licensed dentist through a collaborative management agreement (26 V.S.A. § 614). DTs may work under either direct supervision (supervising dentist is on site, but not necessarily in the room) or general supervision (supervising dentist is not on site). Information about collaborative management agreements and guidelines for drafting a collaborative management agreement is available on the ???. Upon completion of an approved course of study but prior to entering into a CMA, dental therapists must “complete 1,000 hours of direct patient care using dental therapy procedures under the direct supervision of a dentist” (26 V.S.A. § 614). The Department of Vermont Health Access provides information on enrollment and reimbursement for dental therapists serving publicly-insured Vermonters (Dr. Dynasaur and Medicaid). Questions regarding coverage, payment and reimbursement for clients enrolled with a commercial insurance carrier should be directed to those specific organizations.